If you've walked near the upper (north) basin of the west wet meadow, you've probably noticed some large flying critters. At first they seem like bees, but if you get a better look, you'll see it's a large black wasp with three stripes on the abdomen. It's the eastern cicada killer wasp. While big, these wasps are not dangerous to people. The males have no stingers, and the females are not aggressive. 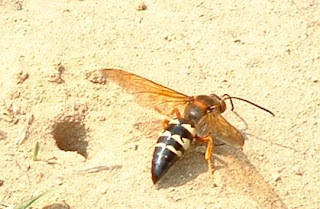 These wasps breed near sandy areas. The females dig holes and bury cicada bugs for the young wasps to feed on underground. This leaves small mounds of sand you can see when walking by. More photos and info at "What's That Bug"
and at Dr. Zachary Huang's Cyberbee site.